The powerful typhoon that has hit the Philippines and Vietnam with deadly force is now battering Cambodia. At least nine people have died in Kampong Thom province in central Cambodia. When Typhoon Ketsana hit Vietnam, more than 30 people were killed and almost 200,000 people fled their homes; severe flooding remains in central provinces. In the Philippines, where the typhoon hit over the weekend, at least 246 people are known to have died. Relief officials in the Philippines, struggling to feed and shelter hundreds of thousands of displaced people, admit they have been overwhelmed by the disaster. They warn that new storms are heading towards the country. In Vietnam, Ketsana hit with torrential rains and winds of more than 150km/h before it headed inland towards northern Cambodia and southern Laos. Typhoons usually weaken on reaching land, but Ketsana is still dangerous, officials said. "At least nine people were crushed last night when their house fell down," said Chea Cheat, chief of the Red Cross office in Kampong Thom province, about 130 km (80 miles) north of the Cambodian capital Phnom Penh. He added that at least 78 houses in his province were destroyed and that heavy rain and rising floods were continuing. International organisations and government officials in Cambodia said they were distributing tents and food to affected people while assessing damage across at least five of the country's provinces. The BBC's Guy De Launey in Phnom Penh said that Ketsana had been devastating when it headed toward the city of Danang, on central Vietnam's coast. The airport and schools were closed. Railways and roads linking north and south Vietnam were cut off. Danang airport has since reopened. 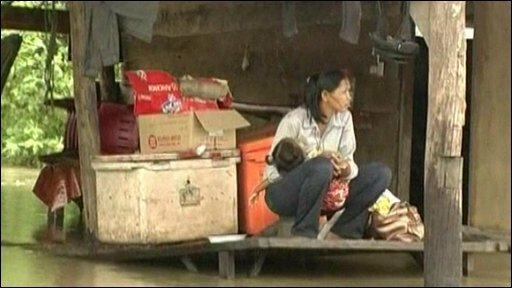 The biggest floods in decades now threaten Vietnam's central provinces, correspondents said, with thousands of homes inundated with water. Vietnamese state media reported that at least 33 people had died from floods and landslides in seven coastal and central highland provinces, and river waters in Quang Nam provinces could reach a level last seen in 1964. 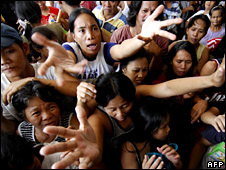 Around 170,000 people were evacuated before the typhoon made landfall. Vietnam's Deputy Prime Minister Hoang Trung Hai said late on Tuesday that he hoped power supplies would be restored quickly, particularly to Quang Ngai province where Vietnam's first oil refinery, Dung Quat, was due to reopen after an outage shut the plant's test runs last month. In the Philippines, the government said it now believed 246 people had died after the storm struck on Saturday, a figure that is expected to rise as mud is cleared from the worst affected areas. Almost two million people were affected by the flooding in Manila, the worst to hit the city in 40 years. At one point, 80% of the city was submerged. Ketsana, with winds of up to 100km/h (60mph), hit the Philippines early on Saturday, crossing the main northern Luzon island before heading out toward the South China Sea. Officials say more than 40cm (16in) of rain fell on Manila within 12 hours, exceeding the average for the whole month of September. Meanwhile forecasters said a new storm forming in the Pacific Ocean was likely to enter Philippine waters on Thursday and make landfall later on the northern island of Luzon. Are you in Laos, Cambodia, Vietnam or the Philippines? Have you been affected by the floods? Send us your comments. Send your pictures and videos to yourpics@bbc.co.uk or text them to +44 7725 100 100. If you have a large file you can upload here.